The book starts off with a discussion of cross-site scripting (XSS) attacks along with examples from 2009 that illustrate the simplicity of these attacks and the significant impact they can have. What’s astonishing is how little many of the attacks have changed. Consider the following example, over a decade old, of HTML injection before terms like XSS became so ubiquitous. The exploit appeared about two years before the blanket CERT advisory that called attention to insecurity of unchecked HTML. The attack required two steps. 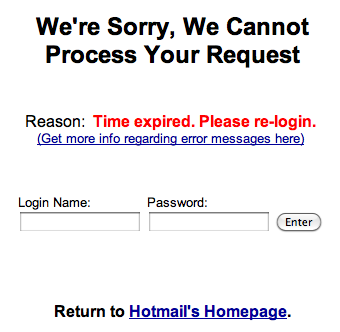 First, they set up a page on Geocities (a hosting service for web pages distinguished by being free before free was co-opted by the Web 2.0 fad) that spoofed Hotmail’s login. The attack wasn’t particularly sophisticated, but it didn’t need to be. The login form collected the victim’s login name and password then mailed them, along with the victim’s IP address, to the newly-created Geocities account.